egta may process the personal information that you give us based on our legitimate interest to provide you with our services. Therefore, as a data controller, we may process your data for activities related to the organisation of this event such as (but not restricted to) circulating attendance lists, recording photos and videos of the event (available to egta members and event participants), or booking travel and accommodation where appropriate. Participants to the event may include egta members and potential members, egta staff, external speakers and sponsors. You have the right to object to this processing, however this may result in us being unable to provide our service to you. You also have the right to request what kind of information we have on you, to object to the storage of this information or to modifications thereof. To activate any of these rights, please contact us at [email protected]. 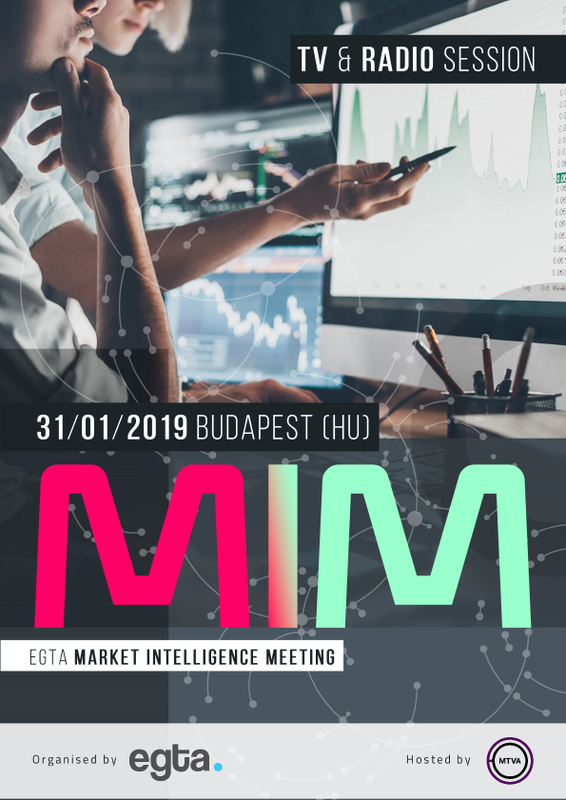 MIM – Market Intelligence Meeting – is one of egta's four annual events. The focus of this conference lies on TV and radio effectiveness, audience measurement and innovative research. Approximately 200 Directors and heads of Research & Market Insights from TV and Radio sales houses from all around Europe will gather to discuss the future of ROI/effectiveness, TAM, data and media attribution. If your job is to juggle with facts and figures to prove TV and/or Radio’s efficiency, this is the place to be! egta and MTM would like to invite senior executives from across Europe to a dedicated working session focused on exploring the challenges facing the European TV industry, identifying the priorities for the industry and assessing the case for action. MTM and its partners (Adobe Advertising Cloud, Alphonso, TVbeat and Sky Media), talking through key findings from an extensive consultation with industry participants across Europe, exploring the strategic priorities for the European TV industry and identifying opportunities for collaboration. A presentation of the key findings from egta’s recent Bridges in (Audience) Measurement (BAM) project (a series of 70 in-depth interviews and a conference that took place on 4 December 2018 in London) and a possible framework for action. In addition, we will work with the attendees to explore and develop a collective plan for the industry, identifying immediate actions, short to medium-term needs and potential solutions. Please come prepared to contribute and participate in the discussions. Price 52€/person - pay here via PayPal (with a credit card or your PayPal account). In order for the link to work properly, open it on a desk/laptop on Google Chrome. If you prefer to be invoiced please request it to [email protected] (invoicing after the event won’t be possible)? Please fill in the form on the left by ticking the orange boxes for the sub-events. If you haven't recieved a confirmation email within a week, please contact [email protected] to confirm your registration. Price: 106.00 € Standard single - 117.00 € Standard double - The local tax is excluded, which is 4% of the net room rate (over 18 years old). Cancelation policy: 30 days before the arrival the cancellation is free of charge, otherwise one night accommodation will be charged. Participation in this event is free of charge for all egta members. Please note that egta offers non-member sales houses and broadcasters access to one event in order to see the association in action and to connect with senior professionals from the industry across Europe and beyond. If your company has already used its complementary entrance, please contact the egta team to learn more about the membership options. If you are an industry partner or technology provider, please contact [email protected] to discuss the terms of entry.